It is very easy to get a marriage license in Chatham County, GA. There is no waiting period and if y’all are coming to Savannah or Tybee Island for your elopement or destination wedding, you can get married the same day your license is issued. All of the official requirements are listed on the Chatham County Probate Court’s website, but here is a summary. You must be at least 18 years of age to apply for a marriage certificate without parental consent. If either applicant is a resident of Georgia, the license can be issued in any county. If neither is a resident of Georgia, the license must be issued in the county in which the marriage ceremony is to be performed. Both applicants must appear at the same time and present a “positive” I.D. Examples of positive I.D.s include a driver’s license, a certified copy of a birth certificate, a military I.D., a passport, or a state I.D. card. If either applicant has been divorced, you must bring a certified copy of your most recent Judgment and Decree with the Judge’s signature on the order when applying for your marriage license. The fee for a marriage license is $66. You will need the exact amount in cash, money order or cashier’s check. You can receive a discount for participating in an approved pre-marital education program. You must apply in person at the Chatham County Probate Court. It is located at 133 Montgomery St., Room 509, Savannah, GA. 31401, and is open Monday-Friday from 8AM to 4PM, excluding holidays. You can call the Chatham County Probate Court directly at (912) 652-7277 with additional questions. 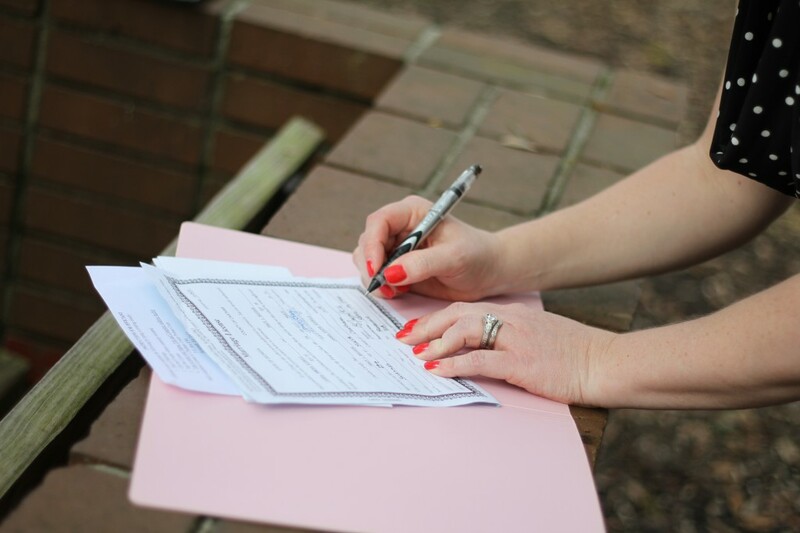 You will file your completed license signed by your officiant with the Chatham County Probate Court in person or via mail using a self-addressed stamped envelope. The court will send you back your official marriage certificate. I can also file your paperwork for you. The instructions for filing for a marriage certificate in Liberty (Hinesville) and Glynn (St. Simons and Jekyll Islands) Counties are similar. Please refer to their websites for specific requirements. You can also use US Marriage Laws to find links to county marriage license rules and application processes across the country. Once you develop a plan to get your paperwork squared away, check out my officiating packages!